Welcome to NutriBee, the Bee-style nutrition intervention that engages youth to make healthful choices and equips them as future nutrition leaders. Our 501c3 non-profit organization considers our mission urgent because at no time in history has a nation enjoyed as many food choices, and never have the lifelong consequences of making poor choices been more apparent. Research conducted at Johns Hopkins Bloomberg School of Public Health found that local NutriBees successfully engage youth from disadvantaged communities and that the youth improve their eating habits. In order to strengthen the impact of the local programs NutriBee incorporates peer leaders, is building a national platform, and involves families. As it turns out Bees did not originate with spelling, math or geography, but with public health. Their origins date back to Colonial America as community-initiated, collaborative and multigenerational service projects. The word Bees means doing good as in boon and benefit. For example, when a family’s farm was damaged by fire, the entire community got busy barn-raising. The first baby showers were quilting bees. Some bees such as corn-husking and apple bees were intended to provide food security for the elderly and disabled. To enhance esprit de corps, bees often included prizes for who could pick the most apples or shuck the most corn and were an intergenerational form of service learning. Communities who participate in NutriBee have an expressed concern about nutrition-related chronic diseases in their community. The community leaders implement the 20-hour local bee in the setting which they consider most suited to their needs, be it in school, after school or as a camp. Communities also choose the local instructors and students to be considered for the national NutriBee. Communities hosting a local Bee are encouraged to involve high school students as peer leaders through NutriBee’s Bee Quest. Collaborative team-based learning is the basis for the 20-hour local bees and he national Nutribee. Early adolescents answer game-show style questions and win prizes as a team which builds sports-team style camaraderie. Inclusivity of diverse populations and the disadvantaged was central to the selection of NutriBee’s 9 pilot sites: Native American communities in Michigan and New Mexico, The South Pacific Island culture of Guam, Urban Baltimore, and low-income rural and immigrant communities in Maryland. 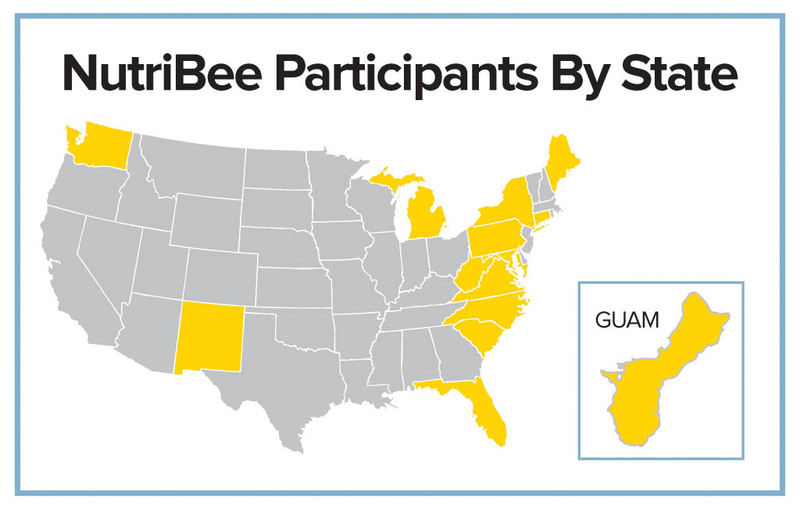 The map below depicts NutriBee pilot programs and Bee Quest 2013-2014 participants by state. We invite you to initiate a local NutriBee or apply for Bee Quest 2017 and put your community on the map. Health professionals are co-instructors who serve as STEM ambassadors. Science: Human biology and medicine, ethnobotonay, biochemistry, chemosensory science, epidemiology, marine food web (the interconnection of food chains), and biophysics. Features science and math in games-based and collaborative learning. Engineering: Chemical engineering relating to food preparation, and mechanical engineering in relation to food engineering processes (the application of agricultural engineering, mechanical engineering and chemical engineering principles to food materials), and refrigeration mechanics as applied to food safety. STEM taught through NutriBee’s engaging nutrition modules has high relevance to the health and wellbeing of family, and is closely linked to cultural identity (i.e. ethnic culinary traditions). Because of the NutriBee program’s measured cross-cultural acceptability, we designed the program to ensure STEM impact across these same communities. 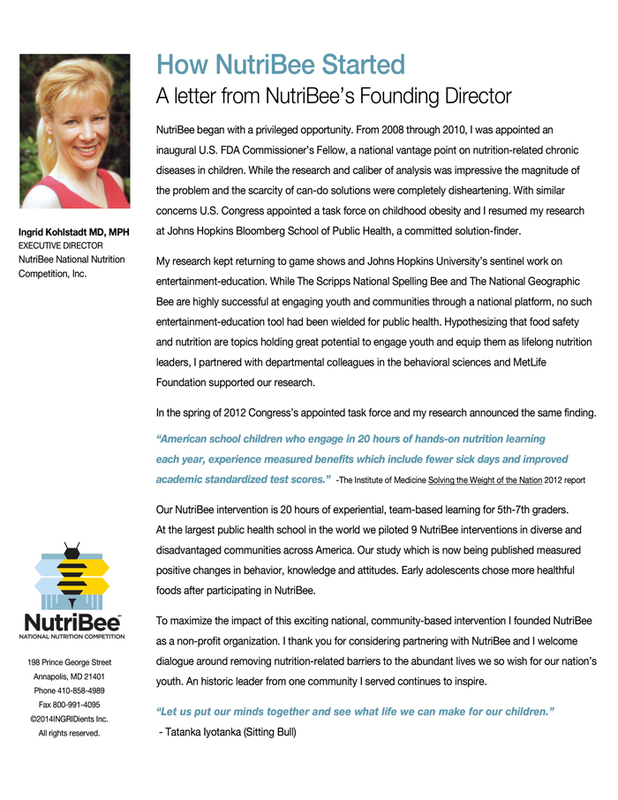 NutriBee was developed, researched, and pilot studied at Johns Hopkins University to advance the critical-thinking skills, conceptual understanding, and knowledge of students ages 9-13 around nutrition, food selection and safe food preparation. It is important to note that in achieving our goal to ensure a citizenry equipped to make lifelong healthful food choices, we received participant feedback that our program generated student interest in learning more about STEM classes, education, and careers.